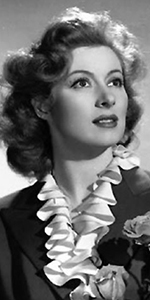 Greer Garson was a popular leading lady at M-G-M during the late 1930s and all through the 1940s. A great beauty with a refined air about her, she excelled at playing smart women struggling through tough times. She did not make as many films as other actresses in Hollywood, but the films she did make made the best of her persona. Borh to an Scottish father and Irish mother, "Greer" was a contraction of a family name of "MacGregor." The intelligent young girl aimed for the teaching profession, attending King's College London, and University in Grenoble, France, studying French and literature, but took a job in an advertising agency. In her off hours, she appeared in local theatrical productions. She became a professional performer at the Birmingham Repertory Theatre in January, 1932. Garson acquired much experience (including playing Viola in an early television broadcast of Shakespeare's Twelfth Night in May, 1937. M-G-M boss Louis B. Mayer was trolling through London looking for talent at the time, and snagged Garson right away. Her first film for the studio was filmed in England: Goodbye, Mr. Chips with Robert Donat (released in July, 1939). With Britain in the war with Germany, Garson was packed off to Hollywood to star in Pride and Prejudice with Laurence Olivier (released in July, 1940), Blossoms in the Dust with Walter Pidgeon (released in July, 1941), and When Ladies Meet with Robert Taylor and Joan Crawford (which played the Chinese in September, 1941). Greer Garson's most lasting performance comes in Mrs. Miniver again with Walter Pidgeon (which had just opened at the Chinese on the day of Garson's Forecourt ceremony). Everyone knew the William Wyler-directed film was one for the ages (president Franklin D. Roosevelt had urged everyone to see it), as a print of the film and other Miniver items were placed beneath Garson's block for posterity. Greer Garson won an Oscar for Mrs. Miniver, then co-starred with Ronald Coleman in Random Harvest (which played the Chinese in December, 1942 —well, January, 1943, really). She followed this up with another key performance in Madame Curie — again with Walter Pidgeon (which played the Chinese in December, 1943). It seemed as though the only actor who matched Garson who wasn't in the war was Walter Pidgeon. She co-starred with him once more in another life-spanning role in Mrs. Parkington (released in November, 1944), but when Clark Gable returned to pictures after the war, Garson was his co-star in Adventure (relased in December, 1945). In Julia Misbehaves (released in August, 1948), Garson co-starred with — surprise! — Walter Pidgeon! but in That Forsyte Woman (released in November, 1949), she co-starred with Errol Flynn, Robert Young and — Walter Pidgeon! Just in case the public hadn't tired of the Garson / Pidgeon pairing, they made a sequel to their biggest hit, called The Miniver Story (released in October, 1950). Garson became a U.S. citizen in 1951, but began appearing in fewer films. Scandal at Scourie (released in May, 1953), was yet another film with Walter Pidgeon. She played the suffering Calpurnia, wife to Barlon Brando's Julius Caesar (released in June, 1953), and took on the role of a school teacher in Her Twelve Men (released in August, 1954). Garson dabbled with television, appearing on Producer's Showcase in April, 1955, ; she made three appreances on General Electric Theatre, in 1956, 1957 and 1960. In 1958, Garson took over the role on Broadway of Auntie Mame from Rosalind Russell, who had left the show to make the movie. She gave a stunning performance as Eleanor Roosevelt in the film Sunrise at Campobello (released in September, 1960). Garson had a huge supporting role with Debbie Reynolds in The Singing Nun (released in April, 1966). Her last film was The Happiest Millionaire (released in December, 1967). She played Aunt March in a television movie of Little Women for NBC, in 1978. Her last television role was on The Love Boat in 1982. In declining health in her final years, Garson died of heart failure in Dallas, Texas, in 1996 at the age of 91. Grauman's Chinese Theatre, Hollywood, California. Greer Garson Forecourt ceremony, Thursday, July 23, 1942. 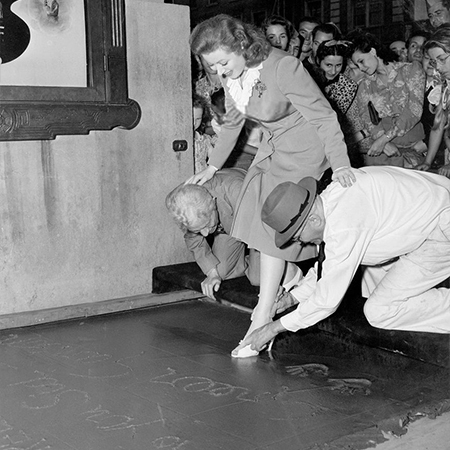 Sid Grauman helps steady Greer Garson as cement artist Jean Klossner makes an impression of her shoe.